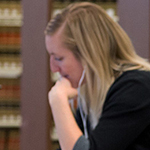 If you want to affect the law as well as understand it, and to serve as a leader in law school, the legal community, and the world at large, the Mitchell Hamline Fellows Program can give you the necessary edge. 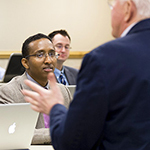 Designed for our most exceptional students, this program links you with a faculty mentor whose efforts and practical wisdom are changing the law itself, and guarantees you a research assistantship, if you choose to take one, with your mentor professor or another member of our faculty, after your first year of law school. Our professors serve the law as critical observers and active participants, and they bring Mitchell Hamline Fellows into the core of that work. The program also links you with student and alumni mentors who can give you practical tips about law school and your legal career. The Fellows Program—always a resource, never an obligation—enhances your Mitchell Hamline experience in numerous ways. First, we give you mentors for each step of your law school career and beyond. You’ll be matched with a professor-mentor who is doing leading-edge research in an area that corresponds to your particular interests. If you are interested in becoming a faculty research assistant—a fantastic experience and great resume-booster!—for academic credit (or for financial compensation if you’re work-study eligible and prefer pay to credit), your mentoring professor, or another professor, may employ you to assist with his or her scholarly research and writing. We guarantee all of our Fellows an opportunity to serve as a research assistant! You’ll also be matched with a student mentor from among the continuing Fellows, and will have the chance to meet with recent Mitchell Hamline alumni who can give you great advice about law school and the transition from law school to a legal career. Second, you’ll have the opportunity, several times each semester, to meet in a small group with the other Mitchell Hamline Fellows and a faculty member who will engage you in a discussion of his or her scholarly research or pro bono litigation. These Faculty-Fellows sessions are designed especially for the Fellows, who are chosen for the program based on their academic and leadership potential. Who qualifies for the Fellows Program? 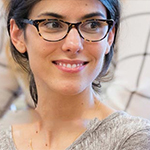 When you apply to Mitchell Hamline, the Admissions Committee reviews your application for the unique combination of traits and accomplishments that distinguish Fellows. There is no single factor that guarantees that you will be invited to participate in this small, highly selective program. We look at academic performance, extracurricular activities, work history, and whether your background indicates a strong potential for abstract reasoning, intellectual curiosity, a solid work ethic, and leadership ability. 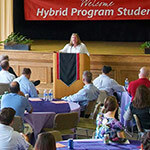 Final decisions are made by the faculty director of the program in tandem with a committee of faculty members and the assistant dean and director of admissions. It’s the extraordinary caliber of our faculty that ensures the quality of our Fellows Program. Mitchell Hamline’s professors have a passion for the law, a drive for social change, and the ability to blend scholarly accomplishment with real-world experience. Listed below are just a few of the faculty members who have participated in the Fellows Program and descriptions of their current or recent projects. Professor Emerita A. Kimberley Dayton is a pioneer in the growing elder law field and has helped define how the legal community thinks about aging and the law. Her current research uses a cross-cultural approach to elder law to expose the ugly, inevitable issue of rationing end-of-life health care expenditures. Professor Carolyn Grose has been expanding the concepts of “reflective lawyering” to equip lawyers to better understand and represent clients whose stories may be difficult for others to understand (whether the client is, for example, a transgendered teacher or a transnational corporation). Professor Emeritus Daniel S. Kleinberger, former director of the Mitchell Hamline Fellows Program, has been immersed in legislative drafting work for more than two decades, with projects ranging from the Minnesota Plain Language Contracts Act to the Uniform Limited Partnership Act. Currently, he is a co-reporter for and principal drafter of the Revised Uniform Limited Liability Company Act. Professor Peter B. Knapp, director of the clinical program, reviews and analyzes the Minnesota Supreme Court’s recent decisions each year, for annual presentation to all state trial and appellate judges, at the request of the Minnesota Supreme Court. Professor Kenneth L. Port, associate director of Intellectual Property Institute, a two-time Fulbright Scholar to Japan, and a former advisor to the Kingdom of Jordan on trademark issues, seeks to persuade policymakers in both Japan and the United States that trademark protection 1) functions properly when it allows producers to “short cut” product source identification (thereby protecting consumers from deceit and lowering search costs) but 2) betrays a dark side as legislatures attempt to expand this right beyond its common law origins. Professor Afsheen John Radsan, former federal prosecutor and assistant general counsel at the CIA, studies the appropriate balance between liberty and security in a world of global terrorism and has hosted public events at Mitchell Hamline with speakers ranging from the former inspector general to the CIA to the author of Black Hawk Down. Professor Nancy Ver Steegh is using breakthrough research on the nature of domestic violence to change the way courts handle domestic violence cases and enable “warring” schools of thought to find common ground.